The A30 and A50 have been launched in the Philippines carrying attractive price tags, with the latter going for P17,990 (around $347) locally. The newly launched Samsung Galaxy A70 and Galaxy A80, however, should prove to be more powerful, more interesting, and more expensive than their stablemates. Flaunting equally large displays at an aspect ratio of 20:9, they promise a cinematic viewing experience as well. Pricing in the Philippines for both handsets wasn’t announced at Samsung’s preview event for local media, but the company says the Galaxy A80 will be available in Europe from May 29 for €649 (P37,886 or $ 731) off contract. The A70, on the other hand, will be sold for £369 (P25,071 or $484) in the United Kingdom starting April 26. That’s quite steep for a non-flagship device, but we also think the price will be much lower here. It shouldn’t cost more than the Galaxy S10e, which will run you P39,990 ($772) in stores. Samsung Electronics Philippines plans to release the Galaxy A70 at local retail sometime in May, we’re told. 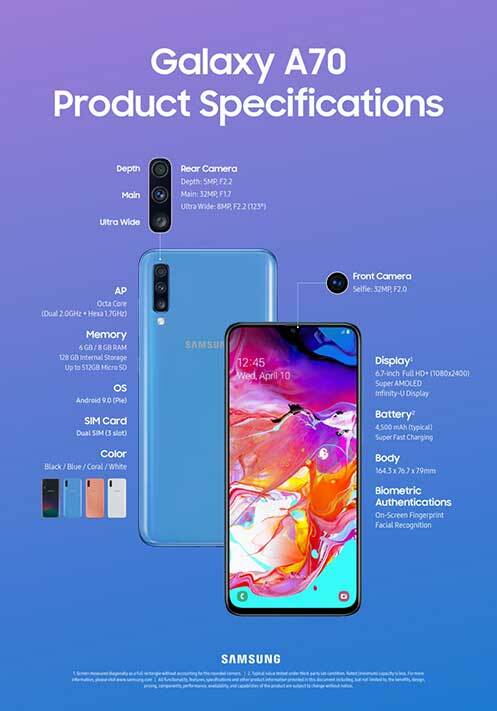 Meanwhile, the Samsung Galaxy A80 won’t arrive here until June, at a price that has yet to be determined. 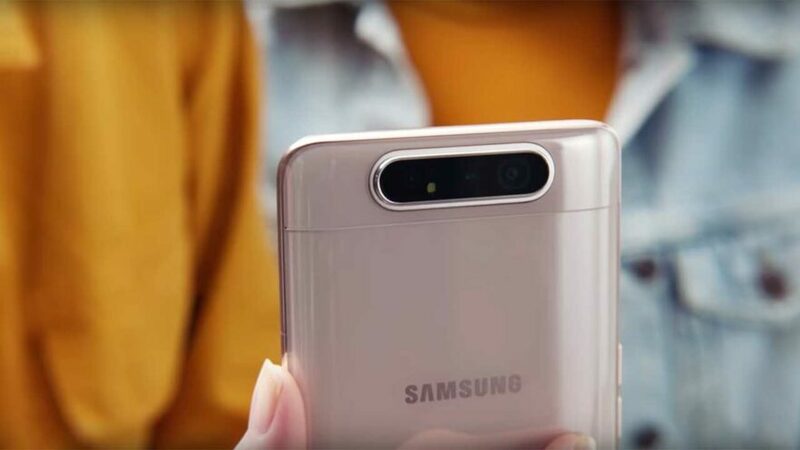 The A80 is Samsung’s first phone with a motorized camera system that automatically pops up and flips over from the rear when you want to snap a selfie. Yes, the same cameras you have at the back — there’s a 48-megapixel main camera, an 8-megapixel wide camera, plus a 3D depth sensor for portraits — are used for selfies and video chat. It’s a clever execution, we’ll admit, but it remains to be seen how the mechanism will fare after a year or two of use. The prototype unit we saw earlier did not seem that well built. READ ALSO: Realme 3 vs Samsung Galaxy M20: Which phone is better? 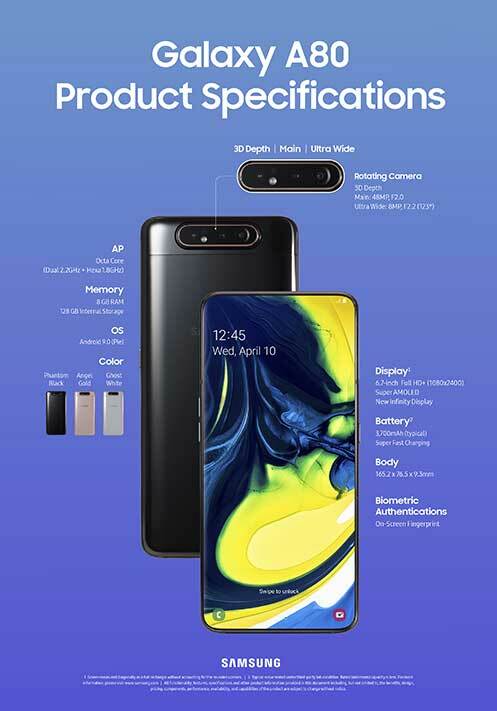 Anyhow, as you can see, the phone’s unique hardware allows for a full-screen front without a notch or punch-hole design similar to the S10 phones. Which is crucial on a device with a huge screen such as this one. The Samsung Galaxy A80 presents you with a massive 6.7-inch screen real estate that can fit more content. It’s Super AMOLED, too, so it’s suited for watching videos, movies most especially, and gaming. Internally, the A80 is powered by the latest Qualcomm Snapdragon 730G processor with 8GB of RAM and 128GB of storage. The battery is 3,700mAh and supports 25-watt fast charging. It runs Samsung’s One UI based on the Android 9.0 Pie build. Moving on, the Samsung Galaxy A70 was actually announced last month via a press release — but it’s only now that we’ve gotten a first look at this Samsung. And what a tall phone it is in person! It’s got a big and bold 6.7-inch Super AMOLED display — one of the biggest ever in a smartphone — with a 2,400 x 1,080 resolution. Like the Galaxy A50 and A80, the A70 uses an in-screen scanner for fast and convenient unlocking. Another highlight is the phone’s triple-camera set at the back, which includes an ultra-wide-angle shooter and a depth sensor for producing convincing bokeh. The front of the phone has a sharp 32-megapixel selfie camera in the notch at the top. It also boasts a high-capacity 4,500mAh battery and comes with fast charging over USB-C.